International and national armed conflicts are usually preceded by a media campaign in which public figures foment ethnic, national, racial or religious hatred, inciting listeners to acts of violence. Incitement on Trial evaluates the efforts of international criminal tribunals to hold such inciters criminally responsible. This is an unsettled area of international criminal law, and prosecutors have often struggled to demonstrate a causal connection between speech acts and subsequent crimes. This book identifies 'revenge speech' as the type of rhetoric with the greatest effects on empathy and tolerance for violence. 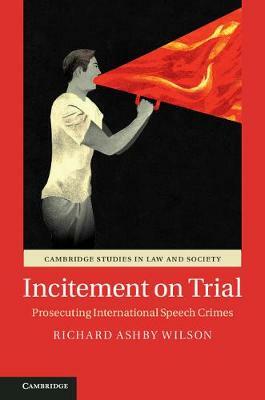 Wilson argues that inciting speech should be handled under the preventative doctrine of inchoate crimes, but that once international crimes have been committed, then ordering and complicity are the most appropriate forms of criminal liability. Based in extensive original research, this book proposes an evidence-based risk assessment model for monitoring political speech.